Are you a smart gambler? Show off your skills in this strategic and nerve-racking card game in which you visit the world’s most famous casinos to become Chipleader. A funny, nerve-racking, and active card game for all ages in which you the rooster must collect and keep as many chickens around you as you can. Submerge yourself in the world of cavemen together with the Odynauts in this exciting and tactical card game for daredevils. Are you a smart gambler? 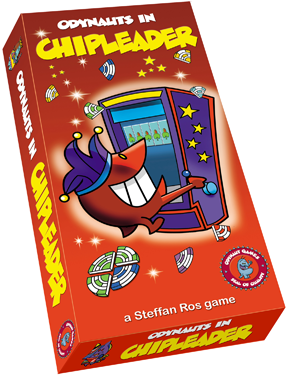 Show off your skills in this strategic and nerve-racking card game in which you visit the world’s most famous casinos to become Chipleader. Your goal is to collect as many of the valuable chips as you can, and to protect them from your opponents’ attacks. Remember that a solid defence is sometimes the best form of attack. Together with the Odynauts visit the world’s most famous and glamorous casinos. Collect nifty chip-piece cards by gambling smartly with suit cards. Make complete casino chips with as many points as possible by putting together four chip-piece cards. Protect your casino chips with face cards or use these to make life difficult for your opponents. Steal cards from your opponents by playing the Ace or Joker cards. Includes well-known elements from the casino such as poker chips, suited cards and a slot machine in a new form for an entertaining gaming experience. Impressive and cheerful illustrations by Uco Egmond, the illustrator of the Eppo comics. Addictive for young and old: no one can say no to this game!